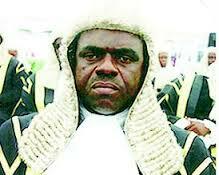 JUSTICE JOHN TSOHO AND THE ROT IN NIGERIA'S JUDICIAL SYSTEM. Nigeria as a theatre of the absurd is no longer surprising. Nonetheless, it is understandable actions, which exposes the extent to which lack of probity and respect for what is moral and logical, does not cease to cause pain. The latest twist in the legal battle of the illegally detained leader of the Indigenous People Of Biafra, Mr Nnamdi Kanu(Prisoner Of Conscience, POC) has really exposed the rot in the fabric of the Nigerian judicial system, which has demonstrated beyond reasonable doubt that, without a root and a branch reformation of the Nigerian judiciary, Nigeria will remain a lawless jungle, where power is to serve personal and selfish ends. A situation whereby a supposed presiding judge will dish out one order or ruling in a sitting, and overrules against it in another, calls for deep reflection and worry. Justice John Tsoho of the Federal High Court, Abuja, had allowed his name to be dragged to the mud due to his compromised stance and decision to allow masked witnesses to testify against Nnamdi Kanu(POC), which he had hitherto ruled against in a previous court sitting. The ill-advised and illegal decision by Justice Tsoho to rescind his earlier decision and to now allow masquerades as witnesses is tantamount to allowing ghost and inexistence witnesses, which obviously was swayed to the dictates of the Federal Government. This has gone ahead to contradict the position of the Constitution of the Federal Republic of Nigeria(as amended), enshrined in chapter 4 which states that "an accused person must be afforded all rights to interrogate genuine witnesses so as to present his side of the matter, to enable the judicial forum exercise its authority in line with section 36(5) of the constitution that guarantees fair hearings to all persons". 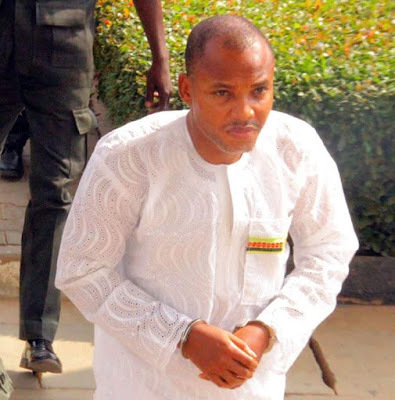 If Justice Tsoho and the Federal government believes that Kanu(POC) has committed those phantom and outrageous charges of treasonable felony and managing and belonging to unlawful organization, why then is the apprehension to produce true and open witnesses rather than presenting false witnesses with a predetermined purpose of misguiding and obstructing the rule of law? It is quite unfortunate and shameful that in this 21st Century, the Nigerian court system could capitulate in the overwhelming blackmail of the Federal government by granting an ill-conceived prayer for masked witnesses, which by all intents and purposes are manifestly illegal and unconstitutional. Just this past week, the media was awashed by a quite similar court case in far away Germany whereby a trial Judge, Thomas Mueller vehemently kicked against the decision of a woman named Amira Behari for wanting to testify against a man accused of illicitly abusing her, wearing a burka/niqab(veil or mask). Judge Mueller who wanted to see her face in order to read her emotions while testifying said; "I need to see you otherwise there will be considerable problems in adjudicating your case". Comparing the two judges(Tsoho and Mueller) in these cases, we can clearly pinpoint which judge has a clearer understanding of what is obtainable in the trial case of the need and importance of unmasking witnesses whether pseudo or real. It is an understatement to say that the Nigerian judiciary is corrupt. A corrupt judiciary will influence judgments or rulings for the wrong motive, while pretending that it is dispensing justice. It will also endeavor to remain true to the overriding objectives of facilitating just, quick and cheap resolution of matters. This is not the case with the Nigerian judiciary. The Nigerian judiciary, based on its recent pronouncements does not seem to be mindful of these fundamental objectives of the court in a way and manner it issues adjournments. I find the idea of adjournments in the way it is been understood and applied in Nigeria, in comparison with other climes, difficult to conceptualise. Even though the Court has both an inherent and statutory power to adjourn the hearing of any case in appropriate circumstances, I cannot imagine a British judge granting ceaseless adjournments under the circumstances they have been in Nigerian courts. Not with their understanding that justice delayed is justified denied. A learned and honest judge would struggle with the idea of permanently suspending the wheel of justice. Not so, with Nigeria's evil genius judges, who seem to believe that, if they can think it, they can do it. The Supreme National Judicial Council has never sat to declare the idea of incessant adjournments in particular cases, perverse and take further bold steps in flushing out and purging itself of its interlopers and rogue elements in the judiciary who have desecrated the temple of justice to enable a level of sanity return to the system. Many of the Nigerian judges like John Tsoho, are audacious and inventive in their subversion and perversion of justice. Many of his likes are hiding behind the law to do the bidding of their paymasters. What is happening in Nigeria is that the judiciary having lost its soul and moral compass has become a pun in the hands of corrupt politicians. The aims of the Nigerian judiciary, would seem to include, frustration of the very process it was hitherto set up to expedite, validating false criminality and giving corrupt politicians a legal way to avoid justice. The incestuous nature of the relationship between politicians and the judiciary in Nigeria, which leaves the judiciary too compromised to ensure accountability and uphold the rule of law which has worsened in this current administration of President Muhammadu Buhari, is anathema to the populace. Why would a judge act to supplant the aim of the court to attain justice? How does granting continuous adjournments and the reversal of previous valid court rulings to the accused, aid justice under the circumstance? Why would an honest judge frustrate or obstruct the trial of an accused(POC) in a criminal case because of procedural error? The continuous adjournments and reversal of rulings in the case against Kanu(POC) is an audacious and shameful abuse of position by both the Executive(FG) and the judiciary(Judge) to frustrate and obstruct a judicial process. There is an urgent need to begin the modernization and reformation of the Nigerian judicial system to ensure that not only legal technicalities but also corrupt and easily compromised judges would no longer hamper the wheel of justice by any means or under any guise for innocent people like Nnamdi Kanu(POC). Once the faith in the judiciary is completely lost and eroded, there is no hope for Nigeria. Nigeria must redefine justice and judicial process for its corrupt judiciary and beleaguered lawyers. Meanwhile, Biafrans will continue to condemn, in strong terms and in its entirety, the way and manner the same court under same Justice John Tsoho made a 360-degree turnaround to probate and reprobate on the illegal prayer by the Federal government to present false and masked witnesses against Kanu(POC). Let this charade called trial end now.